Perhaps the most important maintenance task of all, Windows Update automatically sends security patches to your Windows 8 tablet every Tuesday. If possible, your tablet installs the patches immediately. If the patches require you to restart your tablet, however, Windows Update waits for you to restart your tablet, and then installs the patches as your tablet starts up again. From any screen, slide your finger inward from the right edge to fetch the Charms bar, then tap the Settings icon. When the PC Settings window appears, tap Windows Update from the bottom of the left column. The PC Settings screen shows the Windows Update section. Windows Update requires a working Internet connection to download new updates or check for new ones. 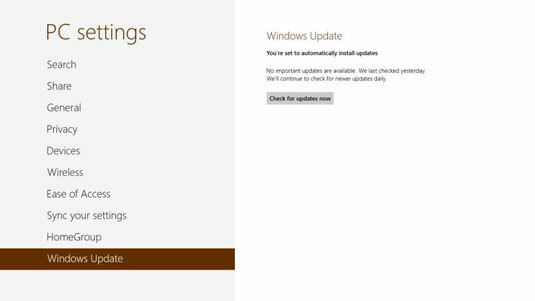 Windows Update only updates your tablet’s operating system — Windows 8 or Windows RT. It doesn’t update your apps, — the mini-programs available through the Windows Store.